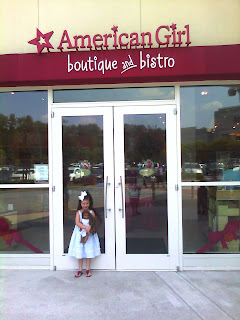 We made our first visit to the American Girl Doll store in Atlanta on Friday. Here is my daughter posing with Kanani, the girl of the year (this is also the doll my daughter purchased earlier in the year through the catalog). We chose a $20 hair style in the salon, a fishtail in the back (similar to a braid) with two colored bows. Then we went into the bistro for "tea" (only $10 per person). I love that the doll even got her own chair! We spent about 1-1/2 hours in the store, and can't wait to go back!